‘This is Nigeria’ is our own way of telling the world we’re not blind even when our voices seem subdued. Our portrait of showing the corrupt leaders, though we are down, we are not out. This is our chance of ringing it to their ears that we are not part of the ruin process, we clamour for a reverse engineering, where all things fall into place, so that one day, we would sit back into our couch & tell our children how we fought in making the world they live in a better place. Nigeria is our own world. The theme is ‘This is Nigeria’. You know your story yourself, we can’t write it for you. This is why we’re giving you the liberty to be whatever you want. Be rest assured that no ‘MURIC‘ is coming for you. We have you covered. We cherish brevity here. Be concise with your analysis and points. 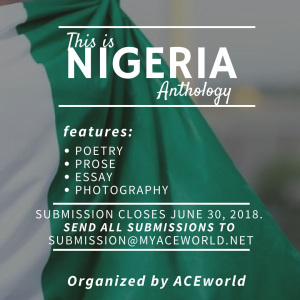 In the subject box, write “This is Nigeria Anthology“. Write your name and contact details in the body of the mail and attach your submission in word document format only (doc, docx). No specification on font style and size. Don’t bother sending your picture. Submission closes June 30, 2018. We need you to edit, re-edit and even edit again before making submission.